Hi Everybody and welcome back to another fun week of What Will You Stamp! This week our featured stamp is Zoo Babies! It's a pretty popular stamp set so I am hoping that we will have quite a few challengers this week. 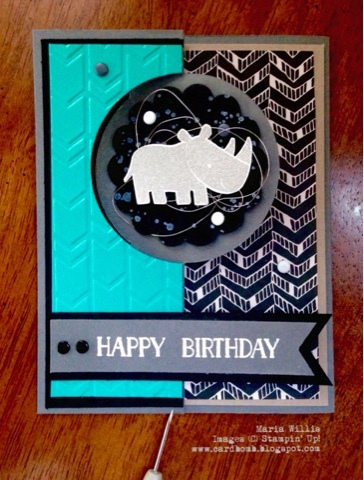 I love this entire stamp set but for today's challenge I was really feeling like I wanted to use this paper from the Go Wild DSP paper stack and I love the rhino paired with it. FYI I'm not really an animal print kind of girl so I overlooked this amazing paper for way too long. The back side of every sheet has a fun black and white print and I have to admit that even I like some of the animal prints (way to go SU!). I haven't made a flip card in quite a while so I decided I would bust out my Circle Card Thinlits Dies and make an extended flip card. So, here's my card! 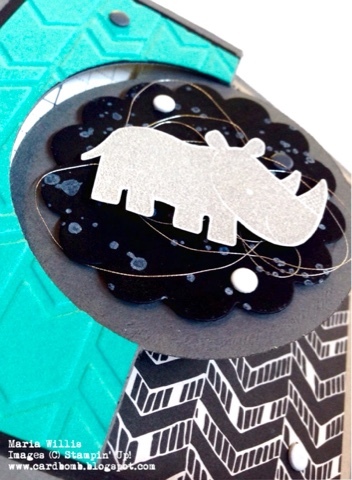 I embossed the rhino in Smoky Slate and used Kraft Ink and my Gorgeous Grunge stamp set to create the background behind the rhino. I added some silver thread and some neutrals candy dots and there you have it folks-a fancy flip card! Do you recognize where that sentiment came from? It's from the Tin of Cards stamp set and I thought the big, bold font was just right for this card. Of course I used my Triple Banner Punch to get those flags just right. I feel like I use that punch for almost every project these days. This card was fun and super easy to make partly because I love this stamp set so much. 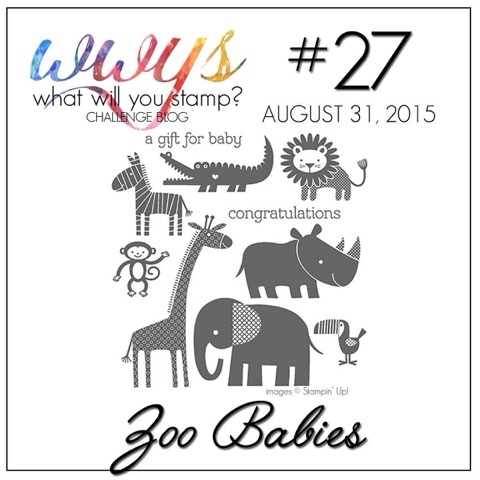 Zoo Babies was one of the first sets I purchased when I discovered Stampin' Up! just about a year and a half ago. I feel like this set is kind of an SU classic (not that I've been around long enough to declare it a classic but you know what I mean-It's been around for a couple of catalogs and is still popular). Do you have this set? Is it one of your go-to sets? Just in case you don't have it here's a look at what the whole set looks like. I'm really wondering which stamps the rest of the design team chose to use this week because they are all super cute! I hope you liked my card for this week's WWYS challenge. I can't wait to see what beautiful creations you all will submit for us this week over at What Will You Stamp? Catch you all soon and until then have a terrific day! 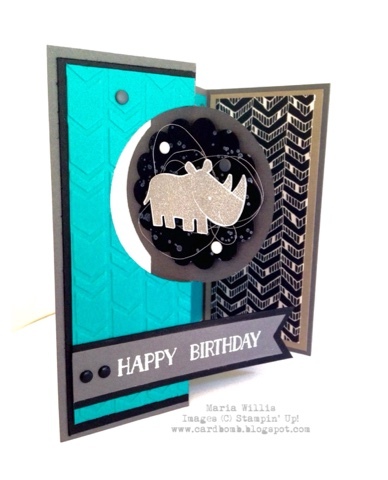 I love this card and color combo Maria!! I need to use that die again for a card!! Thanks Priscilla! I need to make more flip cards-I love them! What a fun card! Love the bold look and color choices! Thanks for inviting me to play along this week! Thanks Holly! We were so glad to have you play along! Honeycomb Hello...Just a little late!